Last year we had the best picture Oscar winner "Green Book" which was a 'feel good' movie about the relationship between a white man and a black man while we also had the intense, involving "BlackKlansman" a best screenplay Oscar winner about a KKK white man and a black policeman who must be played by a white policeman when it comes to a meeting at the Klan which was emotionally involving. 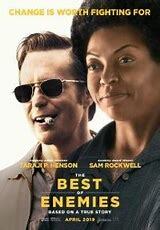 Now we have "The Best of Enemies", based on a true story, about the leader of a KKK group in Durham, N.C. and an angry single black mother who works for an advocacy group and is not afraid to stand up to anyone of any color. What should have been an emotionally involving and feel good story fails on both counts in spite of some excellent performances. My dictionary defines cliche as 1) made stale and uninteresting by repeated use and 2) a trite stereotype expression and both define "The Best of Enemies." I, and by listening to comments by other audience members, learned a new word 'charrette' which is a French word used in problem serving and was what motivated Ann Atwater (Taraji P. Henson) and C.P. Ellis (Sam Rockwell) to each head a panel of their own race and decide whether schools should be desegregated among two other resolutions. Without getting into spoilers, though I did not nor did I ever hear of this particular story, I knew where the story was going and was more interested in how the journey to the ending would go and it was more 'Hollywood' than reality. Rockwell was excellent as the KKK leader married to Anne Heche, who I did not recognize, with 3 children, 1 an autistic child in a hospital, as we follow the arc of his character and how he changes. I love Henson as Cookie in her television series "Empire" but in the last half a dozen movies I have seen her in, including this one, she just doesn't come across to me in movies. I will add that Allen thought she did a very good job as Ann. Others in the cast including Babou Ceesay and Bruce McGill were spot on in their performances while Wes Bentley, who I have been a fan of since 1999 when he was in "American Beauty" seems to have gotten back on track after a problem with addiction. Though I found "The Best of Enemies" disappointing, moving too slowly and not avoiding the 'Hollywood' touches I did learn a new word--charrette--and a part of history that was new to me and has made me interested in learning the whole story. I, also, found the ending credits interesting showing the real people in the story!